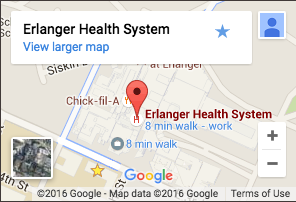 Located in Pikeville, TN, Erlanger Bledsoe Hospital brings academic medical expertise to residents of the Cumberland Plateau and Sequatchie Valley, including the Dunlap and Crossville communities. In addition to 24/7 emergency services, this unique community hospital offers family primary care, the Sequatchie valley’s only cardiac rehabilitation program, and a 25-bed inpatient unit. As part of the UT Erlanger Health System, we also provide weekly clinics staffed by board-certified physicians in cardiology and women’s services (OB/GYN).